Posted: Thursday, June 28, 2018. 4:07 pm CST. By BBN Staff: Parents are already gearing up for the new school year 2018/2019 and Atlantic Bank San Ignacio Branch is making it easy for them by offering great deals on back to school loans. 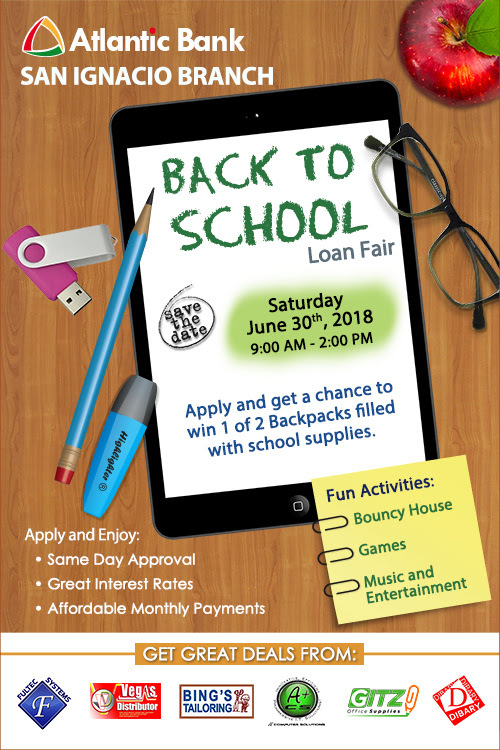 This Saturday, June 30th, the bank is hosting its ‘Back to School Loan Fair’ from 9am to 2pm. The event will be held at the Atlantic Bank compound on the Corner of Columbus Park and Burns Avenue in San Ignacio Town. Residents are invited to take advantage of the bank’s great interest rates, same day approval, and affordable monthly payments. There will be entertainment for the entire family including music, games and a bouncy house. Participating businesses include: Fultec systems, Vega’s distributors, Bing’s tailoring, Gitz Office Supplies, Dibary and A plus. Bring out the entire family!